New York Rangers President and General Manager Glen Sather announced today that the club has agreed to terms with forward Oscar Lindberg. Lindberg, 20, skated in 46 games with Skelleftea HC of the Swedish Elite League (SEL) this season, registering five goals and five assists for 10 points, along with 18 penalty minutes. He established an SEL career-high in games played, and tied his career-high in goals. Lindberg recorded a point in three of four games from November 28 vs. Linkopings HC to December 6 vs. Vaxjo Lakers HC. He also registered two points (one goal, one assist) in five games with Sundsvall IF of HockeyAllsvenskan (Swe-2), while on loan for 14 days beginning on January 17. In addition, Lindberg tallied four points (one goal, three assists) and 10 penalty minutes in 18 SEL playoff games with Skelleftea HC. Oscar Lindberg, who spent the past season in the Swedish Elitserien, is a cousin of fellow Rangers prospect Tim Erixon, who saw NHL action this year. The Skelleftea, Sweden native has skated in 123 career SEL games with Skelleftea HC, registering 11 goals and 15 assists for 26 points, along with 84 penalty minutes. In 2010-11, Lindberg established career-highs with five goals, nine assists and 14 points, while skating in 41 games with Skelleftea HC (SEL). He also tallied playoff career-highs in goals (three), assists (four) and points (seven) that season, finishing sixth on the team in playoff points and tied for fifth in playoff goals. Internationally, Lindberg represented his native Sweden at the 2011 IIHF U-20 World Junior Championship. He tied for fifth on the team in tournament scoring with four points (two goals, two assists) in six tournament contests, and tallied the game-deciding goal in a 6-5 shootout victory over Canada on December 31, 2010. Lindberg was acquired by the Rangers from Phoenix in exchange for Ethan Werek on May 8, 2011. 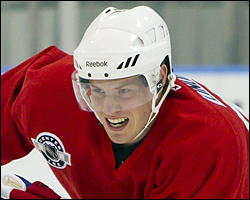 He was originally drafted by the Coyotes as their second round choice, 52nd overall, in the 2009 NHL Entry Draft.